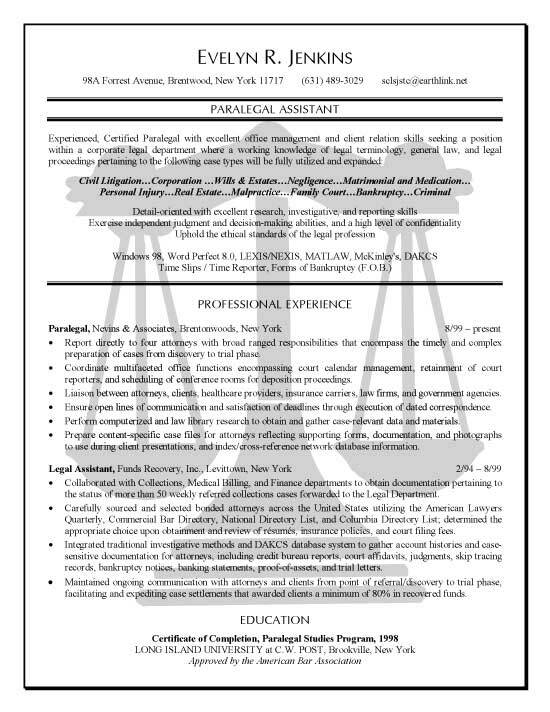 This page includes an example of a resume for a professional with experience as a Paralegal Assistant. This is a good general reference for legal assistants and administrative staff. The Paralegal Assistant resume is unique in that the reader uses a watermark to help identify that the job seeker is in the area of law. This is further detailed by using a straightforward job title headline of Paralegal Assistant. The title is followed by a summary of qualifications and areas of strength listing civil litigation, wills, estates, negligence, personal injury and several others. The job seeker then states a few personal skills such as being detailed oriented and capable of making decisions. Computer knowledge ends the summary portion of the resume. The professional experience section lists the law office, city, state and dates of employment. The bullet points describe duties, highlight key actions and emphasize achievements. Education is listed at the bottom which documents the Certification in Paralegal Studies as well as Approval from the American Bar Association. An accomplished, self-motivated professional capable of handling large case loads and legal projects. Assist with case management, legal discovery and research pertaining to wills, estates, bankruptcy, divorce and leases. Help attorneys write and prepare deposition summaries and documentation for trial preparation. Research past cases to look for statutes and recent decisions made in similar cases. Support house attorneys with legal correspondence, response to memos. File paperwork internally and externally including documentation filing with the court house. Respond to matters related to compliance and regulation. Organize and managed legal databases within the organization including entry and research.